Born in Spain in 1983, Esteban Batallán began his musical studies at the age of seven at the School of Music in his hometown, Barro (Pontevedra). 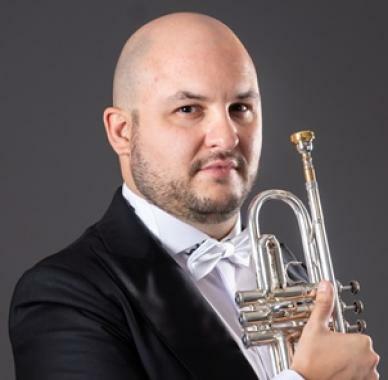 A constant prize-winner in international competitions such as "Jeunesses Musicales International", Yamaha International Competition and "Maurice Andre International Trumpet Competition in Paris", Batallán won the Principal Trumpet position in 2002 in the Orquesta Ciudad de Granada, a position he held until September 2018. During 2015 and 2018 he was Principal Trumpet of the Orchestra of the Teatro alla Scala and Filarmonica della Scala, and in 2016 he was invited by the Symphony Orchestra of India to tour Switzerland and India performing Shostakovich’s Concerto for piano, trumpet and strings. International orchestras he has collaborated include the Chicago Symphony Orchestra, Royal Concertgebouw of Amsterdam, Orchestra of Teatro alla Scala, English Chamber Orchestra, Orchestra Filarmonica della Scala, Gstaad Festival Orchestra, among others. During these years he worked under the direction of great conductors like, Riccardo Muti, Jaap van Zweden, Riccardo Chailly, Zubin Metha, Bernard Haitink, Daniele Gatti, Vladimir Ashkenazy and Alan Gilbert, among others. As soloist he has played with Ensemble Orchestral of Paris, RTVE Orchestra, Orchestra of Córdoba, Gstaad Festival Orchestra, Orquesta Ciudad de Granada, Geneva Camerata, Concerto Grosso Frankfurt, National Youth Orchestra of Spain and Philharmonic Orchestra of Pontevedra. Batallán is the Principal Trumpet of the Hong Kong Philharmonic and Guest Principal Trumpet with the Chicago Symphony Orchestra.